The Queensland exploration geochemistry database includes information on surface and drillholes. The data are generated from open file exploration reports submitted by mining companies doing mineral exploration work in Queensland. This database provides a comprehensive collection of quality digital geoscience data enabling exploration activities to be targeted to prospective mineralised areas in Queensland. Most of the data has been compiled under agreements between GSQ and external contractors. Additional data is being compiled by a new contract agreement with Map to Mine Pty Ltd that began in June 2014. While data is meticulously compiled and verified from open file company exploration reports, its accuracy is based on the integrity of the original data. As at June 2014, the Queensland surface and drillhole geochemistry database contains 3,240,079 pieces of geochemical and drillhole data. The user-friendly digital data can be easily retrieved, interrogated, visualised and integrated into a GIS environment for a range of natural resource studies. ODBC compatible databases can be used as a back-end to the system. 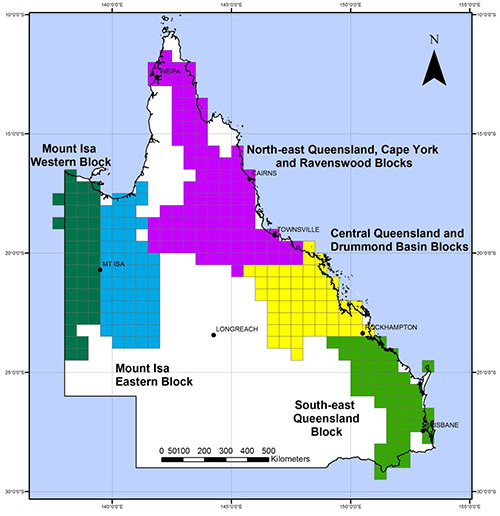 Here is an image of data blocks in the Queensland surface and drillhole geochemistry database. drillholes—this may include core details, regolith, bulk density, water flow, geophysics, and collar and survey data. The geodetic datum for the data is AGD66. The data supplied contains both grid coordinates in metres (easting and northing) and geographical coordinates in decimal degrees (latitude and longitude). You can order a DVD with statewide digital geochemical data from us or you can download the data from QDEX Data. For more information, contact the Senior Geochemist, Geological Survey of Queensland.